I haven't been feeling well over the past week or so (cardiologist appointment on Tuesday, woot! ), so I haven't been up and about in the yard as much. Yesterday, though, my guy was cleaning up the office and was trying to figure out what to do with his old 14" long 3.5" floppy file. I looked at it and was inspired! 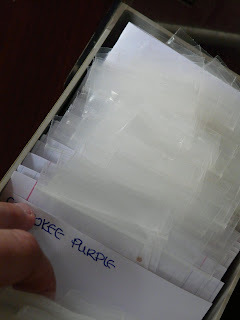 It's a HUGE step up from my prior 'organizational' method -- the seed baggies were just tossed in a box. Now, each flavor of seeds has it's own pocket and the pre-packed bags that are ready to be shipped out are easy to find and I've got MUCH better inventory control. Having everything so organized made me realize how many seeds I've actually collected this year! This 14" long file is completely stuffed, and I still have vials of bulk seeds not packaged yet. Other than that, my winter basil is coming up. My Red Rubin didn't go to seed this summer after my guy conveniently mowed it down, so I started another pot with last year's seeds to keep indoors this winter. The little sprouts are so cute! I love the color that these have and they make such a great addition to pestos. 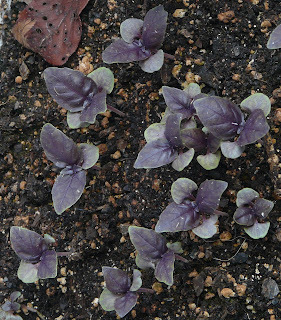 Purple pesto rocks! If all goes as planned, I should have plenty of seeds from these lovelies available on etsy for next spring. So sorry to hear you are not feeling well. Hope all goes well and keep us posted. Your blog looks great btw. I have enjoyed reading through your blog. I gave you an award on my blog. check it out and get your logo! I'll check it out when my attention span returns to that of a fly, cherry. ;) Thank you for the award!